What Is MelRad Multisport Coaching? MelRad Multisport Coaching is the evolution of Mel’s RAD RACING TEAM which was the FIRST triathlon age-group team dominating the US and Canada back in 2009. MelRad Multisport is the evolution of my experience in the sport. 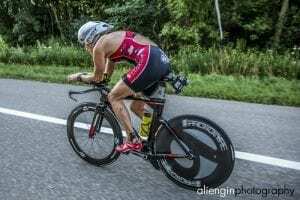 I am offering a personalized training service for athletes pursuing goals in triathlon and cycling. Interested? Please send an inquiry through this website! I have the knowledge and experience to coach endurance athletes interested in all triathlon disciplines and distances, mountain bike events and road cycling. If your goal is your first Ironman or an XTERRA victory, the MelRad Racing Training program is for you! Training should be basic, simple to understand and effective. I will teach you to understand the fundamentals of training and how to get the best of yourself. I personally coach ALL of my athletes. All programs suit your unique needs, limits, and personal goals. I can find the best in you and make the most of the time you have. I have coached athletes to regional age group wins, national wins and World Championship titles. If you want to put in the work, I will show you the way. “Having Mel as my coach this past season was an incredible experience! As she states on her coaching page “If you want to put in the work, I will show you the way” and she did that plus much much more! She delivered me a detailed tailored training program. I found that she was constantly tweaking and updating my program to find a healthy, realistic balance between my work and home life yet pushing me to be my very best in all my athletic endeavours. The level of communication I received through out was astounding as she always made herself available to me by utilizing all methods of communication such as phone calls, texting and emails. Through out my season I felt Coach Mel was fully invested and committed to helping me achieve my lofty goals. I can truly attest that with Mel as your coach you will receive a coaching service of the highest level. I highly recommend Melanie as a coach to anyone! Pre/post event support: analysing race outcome, discussing strategies and approaches. Discussion of race nutrition and approaches to different courses for both mountain bike and triathlon. Sharing detailed knowledge of numerous multiday mountain bike races and how to prepare body and equipment. I not only coach athletes physically, I prepare you mentally. As a coach for executives and a public speaker, I can help you master the mental side of the sport. I will create a personalized Annual Training Plan with your key races in mind and then build a program based on 1-4 week cycles to help maximize your strengths and work to minimize your weaknesses. With a BSc in Chemistry and Biochemistry, I have an objective and scientific approach to training methodology. However, my race experience is how I can get the best results because EXPERIENCE counts. Wins and Podium performances at professional level road, cross country mountain bike, endurance mountain bike, XTERRA, ITU Cross Triathlon, Half-Ironman, Full Ironman, Challenge triathlon, and trail running. I can help you have your best performance and help you control circumstances to make each race one you can be proud of. I understand the intricacies of high performance and the challenge of balancing multisport in a busy family and professional life. I have CAC Coaching Certification in cycling and Community Coaching Certification from Triathlon BC. I have been coaching athletes, pro and amateur, for 12 years. https://melrad.com/wp-content/uploads/2017/12/open-water-coaching-1.jpg 600 600 melanie https://melrad.com/wp-content/uploads/2018/11/MelRad-Logo-smaller-1024x358.png melanie2017-12-14 12:13:002018-11-12 21:30:57What Is MelRad Multisport Coaching? 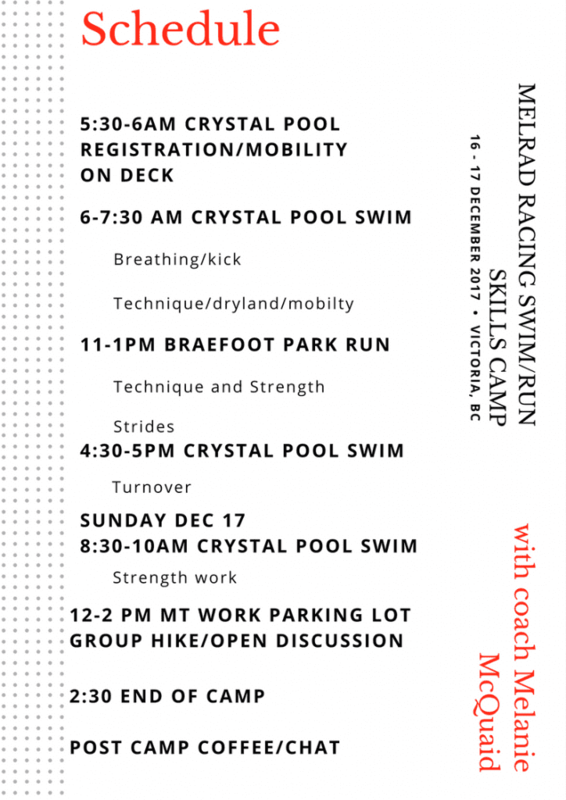 On December 16-17th, MelRad Racing is hosting a swim and run camp in Victoria, BC. You might be thinking: “Why the heck would I want to go train hard RIGHT BEFORE CHRISTMAS?” or “I’m not interested in training before Christmas.” Those are fair comments and I get that it is hard to do camps when racing is a LONG WAY AWAY but I am going to explain why I think this camp is valuable at this point in the year. This camp is not about mileage, fitness, or testing. Instead, the goal is to instill habits, knowledge, movement patterns, and understanding. Athletes need to know where their gaps in competency exist. A coach can tell you “you need to work on your swim” or you can say yourself “I wish I swam faster” but that isn’t identifying the gap. There are a lot of reasons swimming can be challenging. Lack of shoulder mobility, lack of strength in your back, lats, or triceps, incorrect pull in the water, incorrect breath timing, or finally (there are a lot more but I’m trying to keep the word count down) it could be fitness that holds you back. Doing one-arm drills with shoulders that can’t reach an effective pull is not going to effect change on your swimming (meaning drills will be a waste of your time). There are three swim workouts in the camp. Each session includes dryland strength and mobility. There will be three different workouts addressing three aspects of swim fitness: technique, turnover, and strength. I will teach you what the difference is between these different workouts and why you need all of them this time of year. Notice there is no testing and no threshold. We will discuss the foundation of swim fitness and how it is achieved in order to build toward race specific fitness in another phase of training later in the year. Training for triathlon swimming is different than training for pool swimming. Most of the time you are going to be in a wetsuit. This camp addresses that key factor in determining WHAT TO WORK ON. The second objective of this camp is addressing running form***. The most impact of all three sports in triathlon on your body comes from running. Most triathletes have paid to have a bike fit but next to none have had any run form analysis. Most people think they know how to run, but don’t-full stop. Many people do not understand HOW to run.. they just go out and move their legs at a pace faster than walking. With little to no run form knowledge there is exposure to significant injury through poor biomechanics. Triathletes often think they get injured from doing too much speed work and in some cases this is true – but it may not be the speed session itself that is the problem. I would argue that more athletes get injured because their slow runs are not slow enough and/or when they are really slow, their form is bad and introduces risk of injury. As we head into the first phase of base training, doesn’t it make sense to get some work on HOW we run? 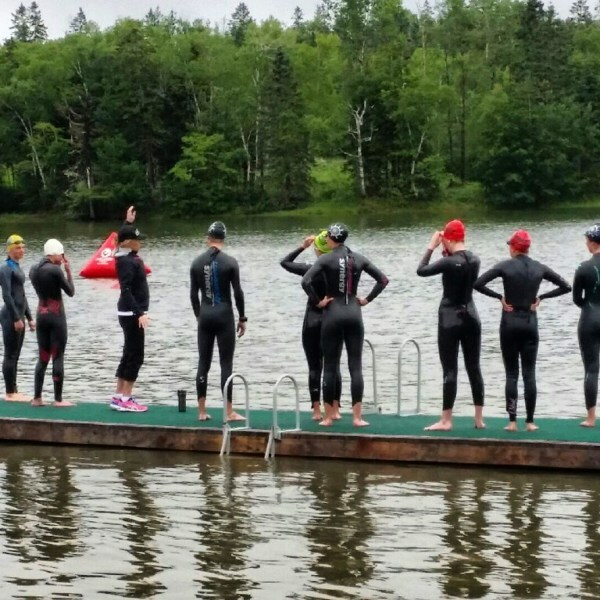 This swim and run camp is going to address how to run EASY (a feeling – not a pace is the perfect definition from my friend Marilyn Arsenault) with an awareness of the things you should ALWAYS be thinking about when you are running easy. All running requires conscious thought and engagement. On Saturday, we are doing a workout with short hills that will introduce how to run WELL, and how to incorporate this work into your program. Finally, we will cap a great weekend of training with a long run/hike on Sunday in the beautiful trails in Victoria using what we learned about being conscious of our form during all of our running. We will also being having a fun camp dinner on Saturday night. 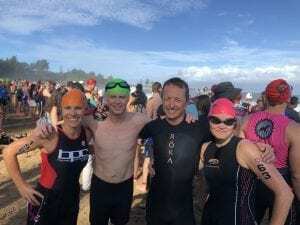 Whether you are focused on Ironman, short course, or XTERRA, this swim and run camp for triathletes is a great foundation clinic on how to approach your workouts to make the most of them in the new year and how to take steps to improve your weaknesses in swim and run. Skipping on one leg is excellent for building specific strength for running – I will teach you how to get stronger with more injury resistance. There are a couple spots left for athletes at this December swim and run camp for triathletes- you don’t have to be coached by me – and the fee for the weekend is $175. If you are interested in taking one of the spots you are more than welcome. Contact me through email through the contact form on this site or at www.facebook.com/melradracing. ***Actually changing how you run takes a long time. This camp with introduce how to start but an EXCELLENT program for athletes constantly struggling with injuries and lack of progress is MINDFUL STRIDES with Marilyn Arsenault. I can introduce you to some of the concepts of run form in this camp and would refer you to Marilyn for a more in-depth overhaul of your running. On December 16-17th, I am hosting a swim and run camp in Victoria, BC. You might be thinking: “Why the heck would I want to go train hard RIGHT BEFORE CHRISTMAS?” or “I’m not interested in training before Christmas.” Those are fair comments and I get that it is hard to do camps when racing is a LONG WAY AWAY but I am going to explain why I think this camp is valuable at this point in the year.